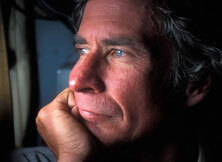 John Vidal reports from La Paz where Bolivians are living with the effects of climate change every day. Their president has called for an urgent 50% cut in emissions – action that is essential for the country’s survival. Click on the image to view video. Ocean acidification threatens over one million species with extinction–and with them, our entire way of life. 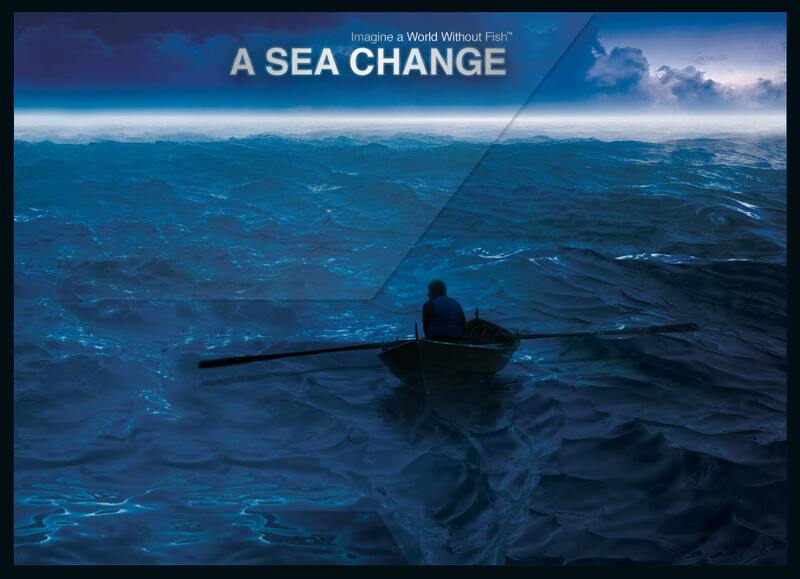 A Sea Change documents how the pH balance of the oceans has changed dramatically since the beginning of the Industrial Revolution: a 30% increase in acidification. With near unanimity, scientists now agree that the burning of fossil fuels is fundamentally reshaping ocean chemistry. Experts predict that over the next century, steady increases in carbon dioxide emissions and the continued rise in the acidity of the oceans will cause most of the world’s fisheries to experience a total bottom-up collapse–a state that could last for millions of years. Read more..
Is there a link between Frozen Woolly Mammoths and Pole Shift? 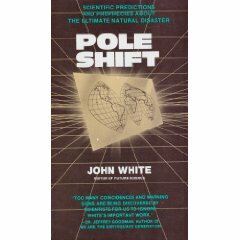 When I first read parts of John White’s 1980 book, Pole Shift, what left an indelible mark on me, was reading the link between the green veggies found the stomachs of frozen woolly mammoths and possibility of relatively rapid shiftings of the earth’s magnetic poles called “pole shift”. Then again, maybe I didn’t read correctly, as the excerpts from an old nhne.com article indicate below, where White is interviewed by David SunFellow. believed White’s book “proved” that Edgar Cayce, and a host of others, had correctly foreseen a global catastrophe that would destroy much of the planet along with major portions of the human race. White’s book was particularly powerful because it was written by a man with serious professional credentials and, perhaps more importantly, because it seamlessly wed modern scientific data with contemporary psychics and ancient myths and prophecies. 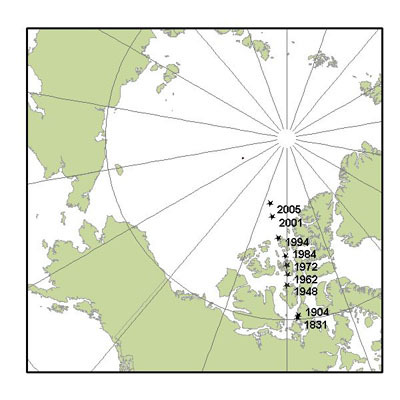 While White refused to say in “Pole Shift” that he was absolutely certain that a pole shift was coming, he left no doubt that he thought one might strike sometime near the year 2000. I was a senior staff trainer at Outward Bound for their Instructor’s Alpine Courses on Mt. Hood. 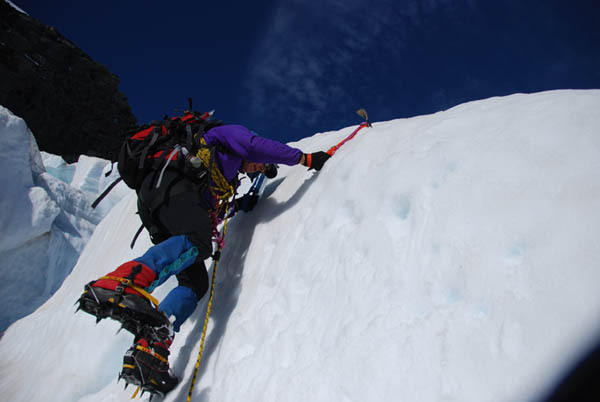 We were finalising a week of training with a successful summit climb. But on the ascent, there was one of those moments, when learning from experience could have been painful but wasn’t, because the outcome was positive. We were climbing the Snow Dome, on Mt. Hood’s northwest side, on the final approach to the Sunshine Route. 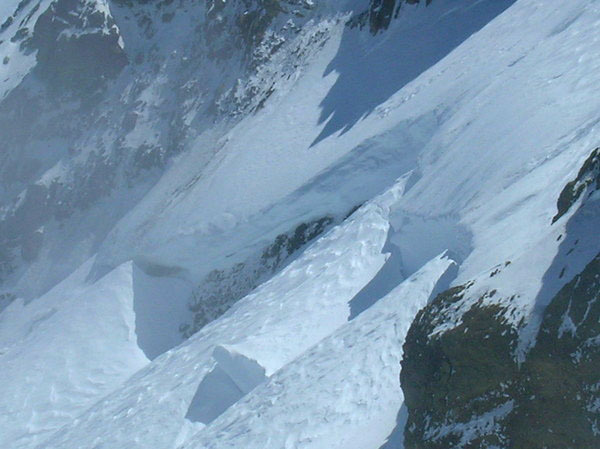 I had been leading and training staff on this route for a few years prior, so was relatively familiar with the route, crevasses and bivy sites. We set out from high camp on the snow dome early on a cloudless sunny day, a crisp snap in the spring air, crampons crunched the snow underfoot. I decided to let the trainees lead out on ropes of four, with one trainer per rope team. There were three rope teams, and my team was in the back, with taking up the final position. It was easy ground, and once we got to the base of the steeper terrain at the start of the Sunshine route, we’d rearrange the order. 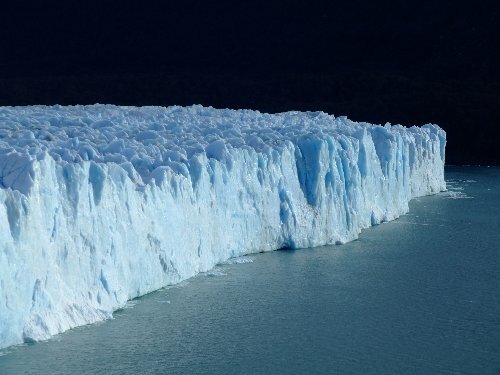 It’s called calving, when a glacier’s edge dramatically breaks off. Many cruise ships take the tour along Alaska’s shores. 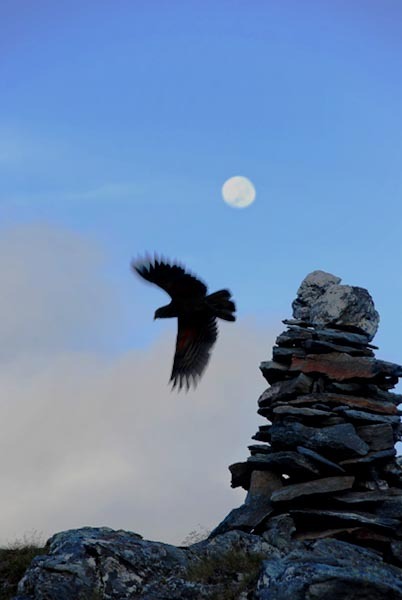 From Seward and other harbors along the coast, one can sign on for a daily round-trip to get up close views. The dramatic Perito Mereno Glacier in Argentina’s Southern windswept Los Glaciares National Park has many visitors.and is possibly the most famous rivers of ice in the world because. It was declared a World Heritage site by UNESCO in 1981. Amanda and I stopped at Tasman Lake in New Zealand’s Mt. Cook National Park to see the floating ice bergs in the grey-green water thick with rock flower. We hiked up to the top of an old terminal moraine and saw the bergs as the sun was setting. More than a few times, I’ve jumped into such frigid waters, after a run or back country mountain sleep, just to wake me up. 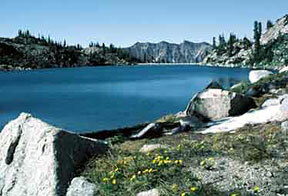 While at University of Utah, when I was still learning about the mountains, I did an overnight up White Pine Canyon in the late fall and jumped into White Pine Lake near Snowbird. A few minutes later, it had a skim of ice on it. That’s chilly, but there were no icebergs or calving going on, just shivering. The Tasman Glacier regularly claves ice bergs but the evening we were there it was calm and each iceberg gave us a show of *“petreflections” of various sizes and patterns. When the ice goes out in Lake Sunapee, NH, the reader may be curious to know that there usually aren’t big ice bergs. Then again, I didn’t grow up on the west side of the lake, where the whole lot piles up on a windy afternoon leaving dramatic piles of ice, as if the town dump truck and just deposited its backlog for the winter. On the east side of the lake, we observe the ice gradually thinning from the spring melt, and as it thins, darkens to almost a black. It turn into “honeycomb ice” we call it, where its transformed from the meter-thick solid sheet that runs the whole lake, to fragile, loosely held together elongated splinters that fall apart when scooped up in your hand. Those of us that grew us as kids along the shore of a lake will know what I mean. Daily we watch the progression. Official Ice Out day is declared when Artie Osborne can take his boat from the north tip at George’s Mills to Newbury, some 10-13 miles distant without obstruction. To my knowledge, he still makes the trip, and in the process, closes the informal town bets for the season. Go swim in an ice-berg filled lake sometime. It’s the right thing to do. Author’s Note: Also see my earlier entry on largest iceberg breaks off of Tasman Glacier in 100 years. *Petreflections: A term coined by Kathy Lowe. See her link above. 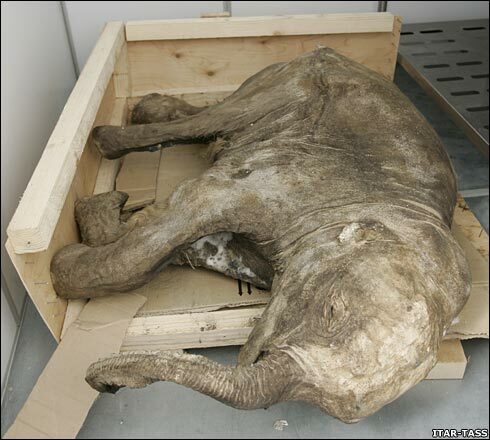 Perfectly preserved, the baby mammoth looks like she has been asleep only for a moment – not for the 37,000 years she has spent locked in the rock hard permafrost of the Arctic tundra. Clumps of brown hair still cling to the three foot tall body, hinting at the coarse coat that would have once covered the infant. Even her eylasahes are intact. Discovered at the side of a river by reindeer herders on the Yamal Peninsula in northwest Siberia, the bone month old female is helping scientists to unravel how the extinct ice age giants once lived. The contents of her stomach have provided scientists with valuable clues about what she and her fellow mammoths ate. The baby’s layers of fat and minerals in her teeth have provided an unprecedented insight into her health and the health of her herd. Palaeontologists now believe the information they have gleaned from the remains can help them understand what led to the woolly mammoths’ ultimate extinction around 10,000 years ago. It is thought that mammoths died out as they were unable to adapt to the changing world around them as temperatures soared at the end of the last ice age, although some experts believe they may have been hunted to extinction by humans. The findings have shown that the baby mammoth was in good health and well fed before its death, suggesting that its herd was able to find plenty of food at the time it was alive. I recently had the opportunity to volunteer at French Ridge Hut last week. We had an unusual clear spell of almost cloudless blue skies, day after day. More times than not, the wind can howl on this ridge, making it difficult to make the journey to the privy, perched on the ridge, (so helicopters can more easily pick up the poop canisters). I recently heard of one fellow who was sent to his death when the hut he was in, was blown off the mountain. I’m sure some of the readers have been on a fire lookout tower in high winds, having complete trust in the structure. Hmmm. Makes one think. Be sure to inquire or check to see if the hut you’re in has tie-down cables. French Ridge does not. I trust the architect, up to a point. It depends on how strong are the gale force winds. This is a bit tongue in cheek, or ice axe in ground. French Ridge and the environs is a magical place. It’s getting a lot of traffic from hikers as well as climbers. I was there later in the season, (just last week), when traffic to and from the Collin Todd Hut, and Mt. 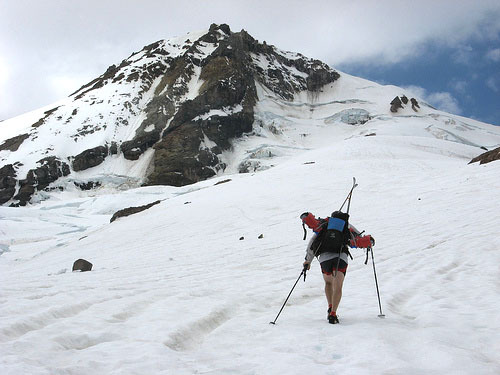 Aspiring had been halted due to the Quarterdeck section of glacier coming down from the Bonar Glacier was breaking up too badly to allow passage. Monkeying around on the "Quarter Deck"
More playing around on some "safe" broken up bits. Hampshire’s Frankenstein Cliff’s. 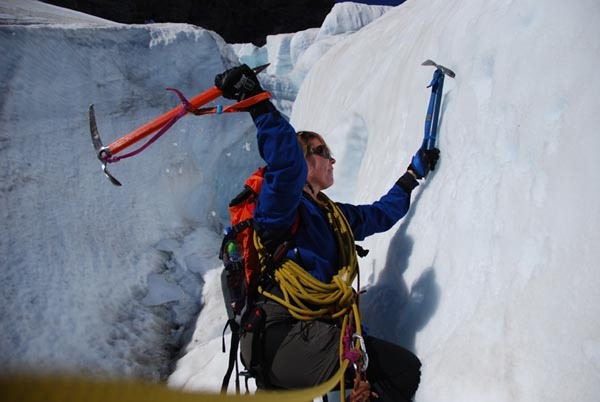 I’ve just read a piece on climbing on the Fox Glacier that has me interested in doing some glacial ice there. 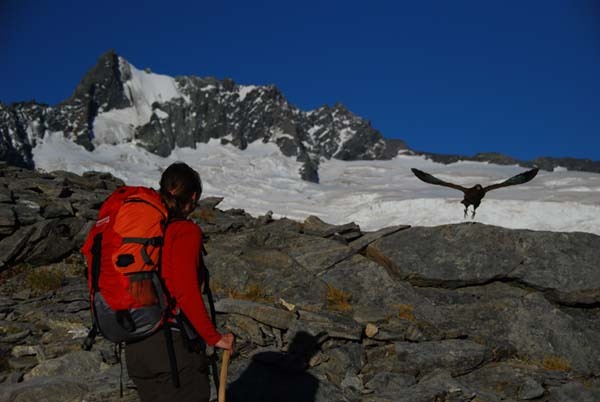 At the hut and just above, Keas, which are amazing Alpine parrots, seemed our constant companions. I figuring out when they would take off, and got some snaps of them in flight. One, at the hut, the other with Mt. Avalanche in the background just above the hut. They are very personable and curious creatures, if not troublesome. When we arrived at the hut on Day 1, the door to the was open, and the keas had made themselves at home, leaving the place a mess. Just across from the Hut, on the ramparts of Rob Roy, is an impressive waterfall. It’s interesting and beautiful because the water comes piling down and hits a flat plateau, shooting the water out into space, like a jet stream. 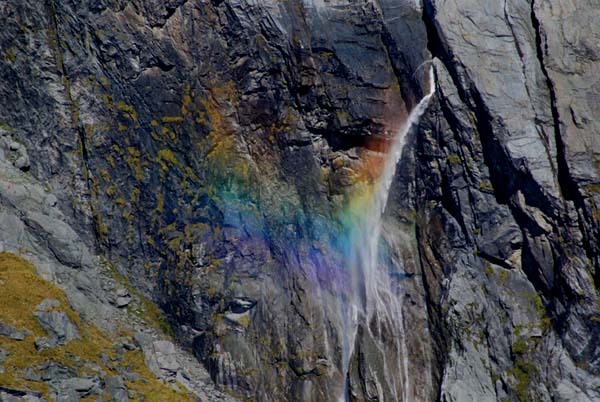 Then when the sun is hitting the wall just right, a rainbow is formed. Kerin Folks Flat on the Wilkin River is about an hour into an eight-hour trek to the Top Forks Hut area. I’ll include more images of that area soon, but felt I had to post this image ASAP. “Rock flour” colours the water the brilliant turquoise blue that is visible in this image. Rock flour is a result of the glacier a few miles upriver, dragging and grinding rocks and stones between the bottom of the glacier and the ground. 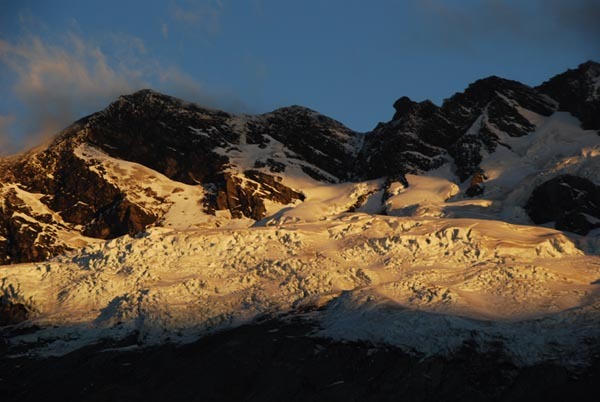 The curious color of the fine powder that comes out of the glacier’s terminus is the subject of many a tourist’s query. So I’ve been told, rock flour is simply mud that hasn’t been exposed to the air. Once exposed, after a number of years, it turns brown. In any event it sure makes for good images. This is probably one of my favorite, even after being a professional photographer for a number of years. 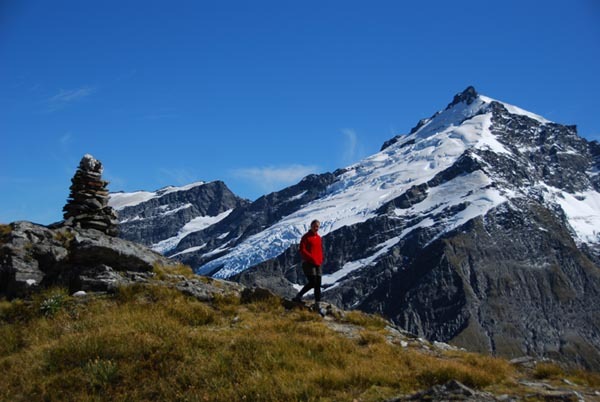 Top Forks is a remote part of Aspiring National Park, right in the center of the park, accessible from the Makarora West village area. The highlight of the Top Forks valley is Mt. Castor and Mt. Pollux from which hanging glaciers drop house-sized ice blocks throughout the day and night, making a roaring sound heard from the hut.